Even though we are starting to have days in the 70s, I have lived in the South too long to be fooled by Mother Nature. She gets extra tricky around here in the Spring time and we’re likely to have a snow shower or a freeze before mid April. The nurseries are overflowing with garden flowers, but No! Do not be tempted! The risks are too great! 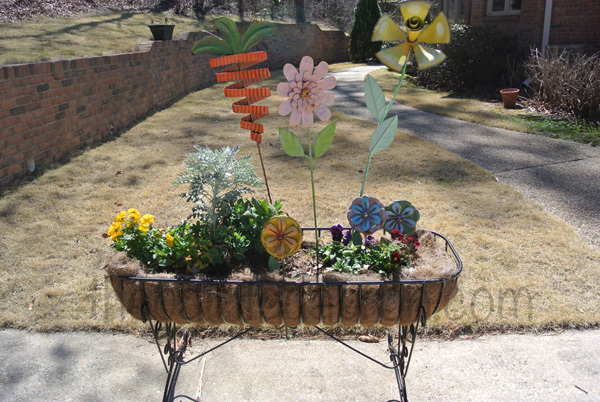 So, to cheer things up a bit, I plant my metal flowers! Come on around to the patio, it’s time for the party! It’s painted with regular acrylic gloss paint. Once it drys it is very durable and weatherproof. 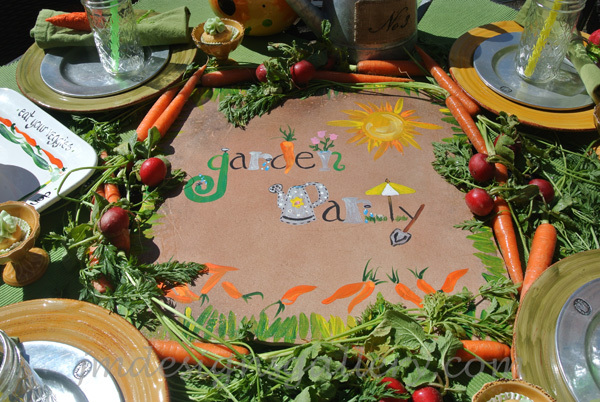 The tile is bordered with fresh carrots and radishes and the places are set with heavy cotton ribbed mats. 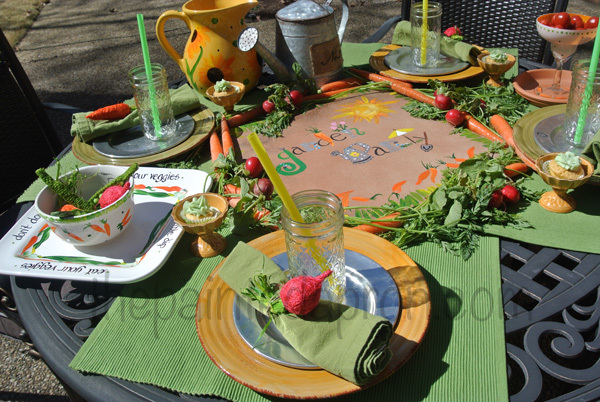 Is it warm enough where you live to have a Garden Party yet? Thanks so much for joining my party today, I hope it’s put you in a sunny mood! It’s OK, Jenna…EVERYBODY’S yard (who gets cold winter weather) is looking like that right about now!!! Everything is bare and brown and blah…and about to get dumped on with 3″ – 6″ of new snow in about 36 hours! 😦 I am thrilled that you are getting some nice weather there already. But I agree with you…don’t be suckered in! It’s a cruel trick! Winter is NOT over! I like those cute little veggies! 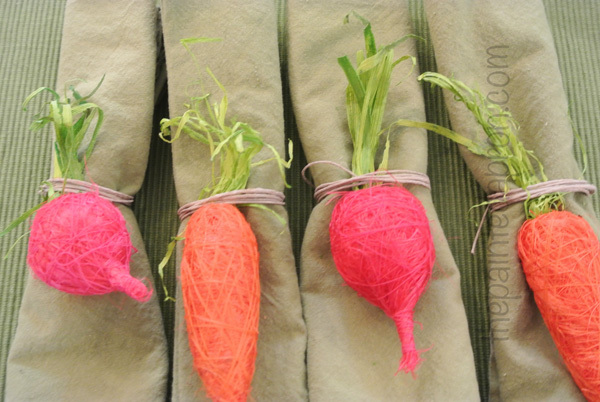 What a cute idea to use them as napkin embellishments! They really liven up the table. The centerpiece is darling. I would never have the patience to paint something like that! 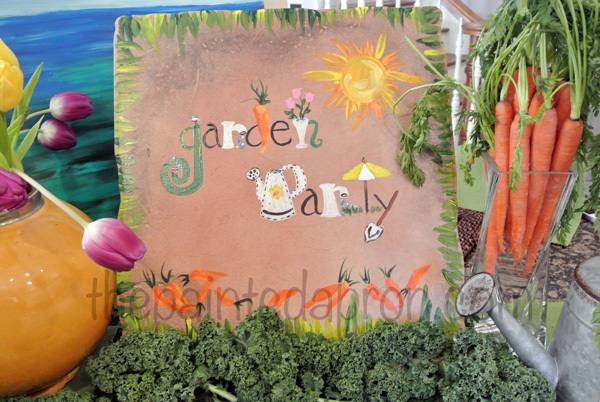 I like it that you used fresh veggies around the perimeter or the sign. Those look great and can be used to make salads or soup (when Mother Nature turns on you!) later! 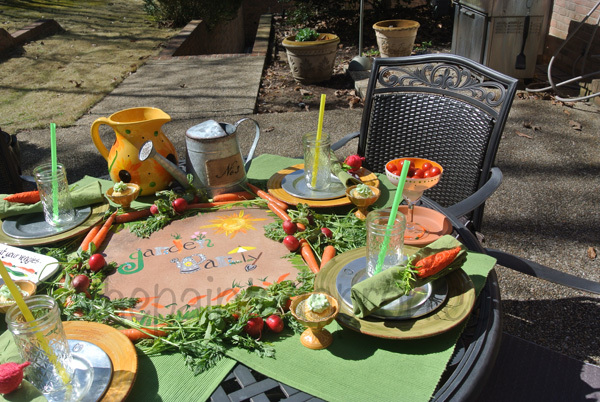 It won’t be warm enough here for a garden party for at LEAST another month! Then we’ll have to contend with rain and wind and pollen. Yippee. 😦 But I have high hopes for the summer months! Have a great day, and I hope the weather holds up for your weekend! Well, the table was photographed last week, and now we are having a freezing rainy weekend, just like I thought, that Mother Nature up to her old tricks again! Sorry you are getting more snow, you’ve had it rough lately! Stay cozy! Thanks Barbara, I got the veggies at World Market several weeks ago so they probably still have them, I just love them, might have to go get more myself! Thanks for visiting! Everything was so delightful…I didn’t know where to look first. But I will say the vegetable napkins rings just rock! This is a darling garden party. The tile centerpiece is a clever idea. Every detail offers a touch of garden delight. Thanks for sharing. Sorry you are having freezing weather again. It’s beautiful here. I’ve been worried that Mother Nature would trick us too. She’s done it before. But it would be really cruel as everything has bloomed out with our temps reaching the upper 80s and into the 90s some days. I’m a southern girl and I know exactly what you are referring to. I have plants that came home with me that I can’t plant yet. I’ve lost to many spring flowers to April’s surprised frosts! 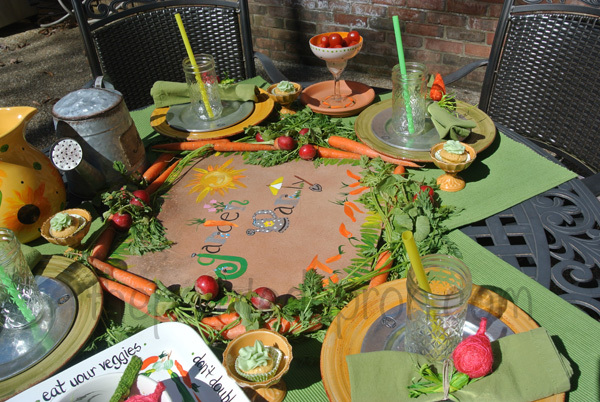 Your painted centerpiece it gorgeous and so is the tablescape. 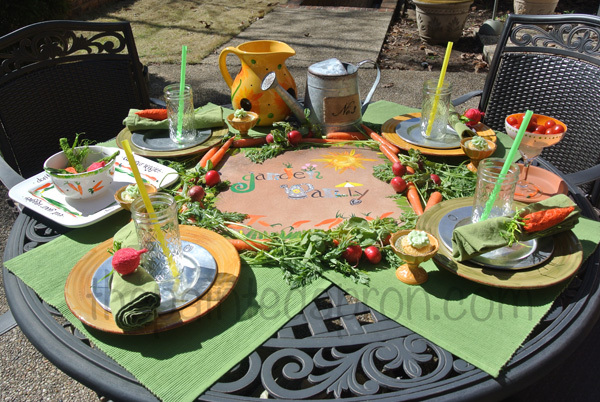 I can’t wait to clean off my outdoor winter table and set a pretty table for spring. Happy Spring. I know what you mean about living in the south – I live next door in Georgia and that storm last night was something! Your garden party looks delightful and I am longing for the time, when I can entertain on my screened in porch. We have not really had a day decent enough, when I have been in town, to get out there and clean it. Oh well, I will be longing for the rain and chilly weather in July!! Very cute garden party. I am ready for a spring party too. I like how you used fresh vegetables around your centerpiece. That is very attractive. Very cute plates and bowls. Well it was warmer earlier in the week here in Texas, but chilly ( brrrrr) today! 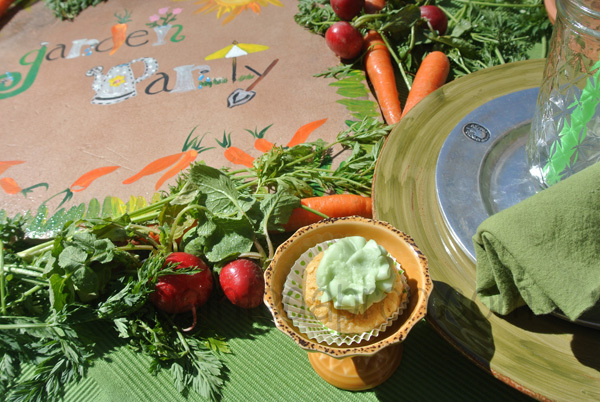 Your garden party is so much fun. I really enjoyed seeing your creativity. Thanks Kitty, I know 48 degrees the past few days, and supposed to be sunny and high 70s tomorrow, so we might be on the patio this weekend, Yea! 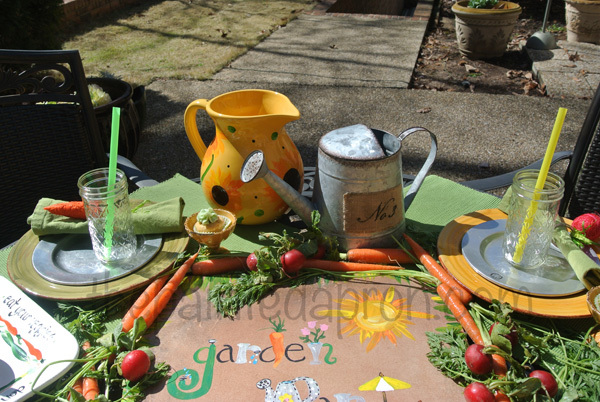 I just adore your garden party tablescape! 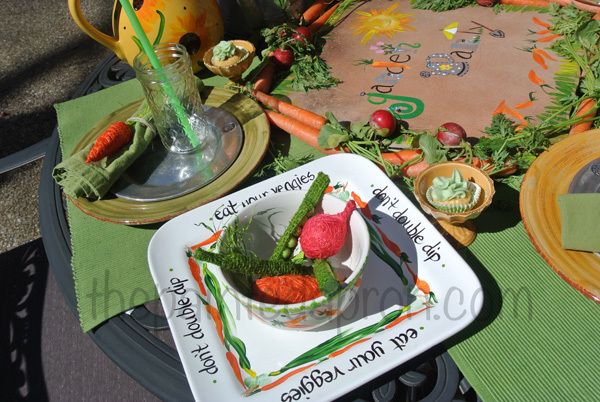 The painted tile centerpiece is so creative and different, and I’m really admiring your veggie dip and chip set! I just bought some faux veggies to use on a wreath, but now I’m thinking that I need some to make some napkin rings. Thanks so much for the idea! Thank you Jane! Your veggie wreath sounds adorable, now I want to make one! Talk about the weather being a jokester, it certainly is in Houston where is is dreary and chilly today. Your garden table is a delight and I’m glad you had a wonderful day to enjoy it. That is sweet! 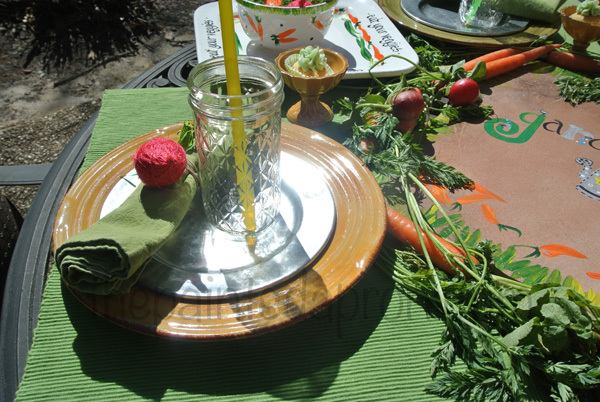 Great garden party, love the veggie napkin rings! Thanks so much for linking to Let’s Dish, have a good week!